Bail-In and Total Loss-Absorbing Capacity (TLAC). 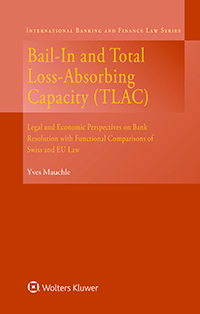 Legal and Economic Perspectives on Bank Resolution with Functional Comparison offers a detailed and comparative analysis of Swiss and European Union (EU) law relating to bail-ins and their economic impact. As opposed to a bank bailout, a bail-in occurs when creditors are forced to bear some of the burden of bank failure. The principal aim of this restructuring tool is to eliminate some of the risk for taxpayers. Several jurisdictions, including Switzerland and the EU, have adopted legal provisions regarding the bail-in, but until now, book literature on its implementation has been scarce. This is the first book to provide an in-depth coverage of this new method of dealing with the failure of systemically important banks. cross-jurisdictional issues and aspects of international cooperation. As well as case studies and analyses of legal issues with particular reference to Swiss law and the European Bank Resolution and Recovery Directive (2014/59/EU), the author applies economic concepts to the analysis of the law. International developments, in particular standards issued by leading regulatory bodies, are also covered. This book focuses on the development of perspectives on the implementation of a bail-in by the resolution authority. In addition, the economic and legal issues of bank bail-ins are identified, analysed and critically assessed, with particular reference to Swiss and EU law. As a detailed analysis of a new and highly significant development in banking law, this book serves as an invaluable tool to legal practitioners working in banks and in banking regulation and by policymakers seeking information on the practical issues involved.